One day, when Joey is on his way home from school, he happens upon a couple of bullies who are playing around with a Heybo. Long story short, the bullies manage to get the robot run over by a car and Joey retrieves the wreckage from a trash can. Once home, Joey fixes the robot and names it Heroman. Later that night, a thunderstorm results in Heroman getting wet and, improbably, struck by lightning. The result is amazing, Heroman grows massive in size, gets emblazoned with the colors of the American flag and responds to Joey's commands! At the same time in space, an alien race called the Skrugg is preparing an invasion of Earth. Now it's up to Joey and Heroman to save Earth! Over the years there have been several attempts at merging Eastern manga and anime with Western comics and cartoons. Batman had two manga outings (Child of Dreams and Death Mask), while the X-Men saw their manga counterparts run straight into a wall. Spiderman and The Hulk made appearances as early as 1970, and many people already know about the promised anime adaptations of several well known titles (Wolverine, X-Men, Iron Man, etc). The problem is that all of the attempts thus far have not been as successful as one might hope or expect. One of the reasons for this is because the titles that have been adapted to date are already well known, and each has a wealth of existing storyline that makes reinvention more difficult (which some may find odd, but have a think about and you'll understand why). It's strangely ironic that it has once more fallen to Stan Lee to light the way forward. Originally a manga written by Stan Lee himself and drawn by Ota Tamon, Heroman tells the story of Joey Jones (a true Stan Lee name), an orphan living with his grandmother in Centre City. He spends his days attending school and working part time at a cafe (where Stan is also a regular customer), but all the while he wishes more than anything to be a hero. In all honesty I wasn't sure what to expect from Heroman. The name itself is very typically Stan Lee in its simplicity, but one would expect a tad more complexity from the story itself. The plot is very, very straight forward and in true Stan Lee fashion, the story can at times be very "preachy". That said, the simplicity of the tale is rather appealing as there aren't any of the hang ups typically associated with East-West crossovers. The main reason for this is because Stan Lee decided against using pre-existing material and started from scratch on a totally new idea. He wanted to create "a hero for the 21st century", and in a certain sense he managed to achieve part of that goal. The only problem is that while Heroman may be a different take on traditional heroes for the Western world, the whole idea itself is a throwback where Eastern media is concerned. An orphan and a giant robot are nothing new in anime and manga. Giant Robo: The Day The Earth Stood Still showed just how good the format could be given the right setting, story and characters, and that's just the tip of the iceberg. Other shows like Tetsujin 28, Gad Guard, Top wo Nerae and even Tengen Toppa Gurren Lagann all play around with the concept to a degree. Anime and mange are rife with tales of humans and their super robot counterparts, so it may seem a bit strange that Stan Lee would use the idea to herald a new age of crossovers. Thankfully Stan is a very clever man (I'll explain this in a bit). Bones have produced a very good looking show for the most part. The animation is very crisp and fluid, and the numerous actions scenes are choreographed very well. The characters follow Ota's original designs for the most part, and are reflective of the shows Western heritage, although one does have to wonder about the patterning on Heroman as it seems a bit too US-centric. One thing that bears mentioning is the palette used throughout the series. Bright, bold colours abound which, together with the distinctly Western characters, give Heroman an air more akin to traditional Western comic book adaptations (the original X-Men cartoon for example). Unfortunately, while the visuals may be very good, the same can't be said of the acting. Komatsu Mikako and Kimura Ryohei play the roles of Joey Jones and Simon Kaina fairly well, but the series has one inherent problem when it comes to acting. The whole show is geared towards a Western mentality, a factor which will inevitably cause problems for any seiyuu unfamiliar with the mindset. Because of this there are occasions where the acting in just doesn't seem to mesh well with the on screen action, and there are several occasions where the actors either ham it up too much or become completely wooden. That said, the series will probably receive an English dub at some point, but whether that is better or not remains to be seen. A big plus for Heroman is the quality of the sound effects, almost all of which are crisp, clear, and very well choreographed. The series is littered with great noises, whooshes and explosions, all of which would become a veritable cacophony if they were mixed with music, so it's a good thing the majority of the show is relatively unencumbered in that department. The background music is often subtle and varied, and the tracks are used in a very intelligent manner. Like many other anime out there, Heroman makes use of two opening and ending themes to highlight the midway point of the series. The first twelve episodes feature "Roullette" by Tetsuya (of L'Arc-en-Ciel fame) as the OP, and "Calling" by Flow as the ED. Both are upbeat, but very typical, J-rock tracks that work quite well with the theme of the series. The OP and ED for the second half of the series, "Missing" by Kylee and "Boku no Te wa Kimi no Tame ni" (My Hands For You), by Mass Alert, are far less upbeat than the first two tracks. "Missing" is more of an emotional rock track, with all that entails, while "Boku no Te wa Kimi no Tame ni" has a slight feeling of angst. Strangely though, both tracks are equally well suited to the series, especially given that events become more serious later on. As for the characters themselves, well, anyone who has read a Stan Lee comic will find many things that are familiar, but that doesn't necessarily mean that they're good. Joey develops fairly well over the course of the series, but the main problem is that he is the only character who receives any substantial growth. What is surprising is the lack of attention given to Simon, Lina, Professor Denton, and even William. It would have been nice to have more insight into their respective characters over the course of the show, and while there are some efforts made in that direction, these seem more like afterthoughts than anything else. My main gripe with Heroman is that William Davis, Lina's older brother and the guy who keeps tormenting Joey, doesn't get anywhere near the attention he deserves. Yes, he starts off as a bully, but his transformation is just as profound as Joey's, and it would have been nice to see how his character copes with the change. Now while it's pretty obvious that the series possesses a number of issues, that doesn't mean I didn't enjoy it. The truth is that even with all its flaws, Heroman is a rather entertaining series, especially as it's a throwback to the super robot shows of bygone days. Yes it has more cheese than Switzerland (and the plot has about as many holes), but the story is well put together and the whole thing looks good. Granted there are problems with the acting but they're mainly from cultural differences rather than a lack of talent. Which brings me back to the reason why Stan Lee is a clever man. When one considers Heroman from a manga and anime perspective, it clearly falls short of the mark set by many other super robot tales. Likewise, when consider from the perspective of Western cartoons and comics the series is nowhere near the level of Stan Lee's more popular franchises. Where people get it wrong is in assuming that Heroman is an attempt to cross the East-West divide. It isn't, and the proof of that is in the fact that we have a traditionally Japanese super robot show created by an American and set in the US. Heroman isn't an attempt to cross the divide, no, it's an attempt to bridge it. By choosing this type of show, Stan Lee is sending a message to both DC and Marvel that if they want to crack the Eastern markets then they need stop trying to re-invent existing heroes, and should instead focus on creating new content using existing manga and anime as inspiration. Heroman may not be as good as some of the older super robot shows, but what it heralds may be a new dawn for anime and manga, especially if Marvel and DC get the message. How ironic that Stan Lee would have to go to Japan to make a good old-fashioned American style superhero show, but in an era where it's more common to see parodies, dark twists and subversions than the genuine article, it's nice to see a callback to the good old days. The heroes are very heroic, the villains are very evil, and we never question for a moment which side is in the right. The robots are awesome, the monsters are creepy, and the action is a blast to watch. Ordinary teenagers have ordinary teenage problems, nosy adults worry about their kids, and life gets a hundred times more complicated when you have to balance out superhero work. They just don't make shows like this anymore, which is a shame. I have nothing against complex or innovative storylines, but I hope people never lose their appreciation for simpler pleasures like this. Heroman was made by Bones, which means it has some of the best animation on the market. The visuals are fluid and detailed, and also incredibly stylish, with lots of bright (but never garish) colors, expressive faces, and some increasingly cool and imaginative battles. It's also nice to see how much effort went into the design work; it's true that a lot of the character designs and outfits fall into basic stereotypes, but they're at least American stereotypes instead of Japanese stereotypes of Americans. Some of the characters do suffer from anime hair, though. Everything else, from the layout of Joey's hometown to the cars, cafes and even the houses are unmistakably American-looking. We probably have Stan Lee to thank for that authenticity, and it's part of the reason a lot of people, myself included, say the show would do well on American television. This is one of the best-looking kid shows I've ever seen. The music score consists primarily of loud electric rock. It's intense, fun to listen to, vaguely reminiscent of Soul Eater's score and just as effective in setting the mood for all the series' fun action scenes. The show brings out some softer pieces here and there as needed, but the battle music is what you're going to remember. I just have one language track to judge this time. As always, I have a hard time judging the voice acting in a language I don't speak, but to my non-fluent ears it sounds like a perfectly comic-booky archetypal cast, which is exactly what the show needs. There's not a lot of subtlety, this isn't a very nuanced show, but the characters that are meant to be over-the-top sound deliciously so. They shout with passion, laugh heartily and even carry the show through its tender moments. Heroman's voice, comprised solely of groans and grunts, is uncredited and possibly synthesized, but man does he sound like a big badass robot. Joey is the only male character voiced by a woman, but he's supposed to be a very wide-eyed and boyish character (he even looks androgynous), and Mikaku Komatsu gets this side of him across fine, so I'm okay with this. As far as teenage superheroes go, Joey Jones is cut from the same cloth as Peter Parker. He's not particularly popular, but he still has good friends he can count on. He's not particularly intelligent but he does have a clever streak. He's at that age between childhood and adulthood, where he has concerns like whether his love is reciprocated but still retains a boyish heart. It's a decades-old character archetype, but if executed well it can still make for a likable lead, and that's just what Joey is. His friends and relatives all fall into the simple and likable category as well, they can all more or less be summed up in two or three sentences, but when push comes to shove you still find yourself rooting for them. All of them, that is, with the exception of Joey's best friend Psy, who is implied to have once been one of "the cool kids" and possibly a bully himself before a leg injury got him removed from the football team. It's not terribly important to the story, but a little extra effort is always welcome in my book. Joey's brash but caring sister Holly, zany mad scientist Professor Denton and mutual crush Lina have their moments to shine as well, creating an all-around lovable core cast. As per the title, though, the real star of the show is Heroman himself. This series is a no-holds action spectacle, plain and simple, to dwell on anything else for too long would be completely missing the point. The Skrugg are definitely a viable threat, aptly modeled after cockroaches with strength and weapons humans can't match. They just want to take over the world and kill everyone, and all the other villains have very simple comic book-y motivations for what they do. And you know what? I wouldn't have it any other way. It is immensely satisfying to see Heroman beating up the arthropod invaders, discovering more powers he can add to his arsenal, all the while showing off his flashy all-American paint job. Occasional use of stock footage notwithstanding (and the stock footage is actually pretty awesome) the crisply animated fight scenes only get more imaginative as Heroman gains new powers and new enemies. After a little while Joey even gets some powers of his own, thanks to his gauntlet, and actually, I'd say giving him the chance to fight alongside his giant robot was probably the show's biggest stroke of genius. It adds that touch of human involvement to the fights that we just couldn't get from the silent, stoic Heroman, who only occasionally shows signs of sentience. By giving Joey a more direct involvement in the fights, which only increases as the story progresses, we're given a good look at Joey's personal growth, and that's handled quite well. The best part is, it never gets too dark or violent or complicated for children to watch and enjoy right along with you. Compelling as it is, Heroman has as many problems as any awkward boy in high school. The show is pretty well-written on a whole, but the pacing isn't always up to scratch. I mentioned earlier that this isn't a character-driven show, and while they're all very likable, their development is nothing we haven't seen before. Make no mistake, the show's character drama works really well when it's used sparingly; it's cheesy and often melodramatic, but that's the point. During the lulls between battles when the characters have to carry entire episodes on their own, though... well, it's still pleasant to watch, but it's definitely not the show playing to its greatest strength. Meanwhile, we only get brief snatches of development from Psy, the character that does seem to have some hidden depths. The series' low point comes in the middle, when Joey finds himself on the run from a government agency and has to hide out in the woods without making too much of a scene. Yeah, the whole "fugitive evading the authorities" story gets old really quickly. You can always be sure the show has something more waiting just around the corner, though, and when it's all cylinders firing, it's an absolute delight. The series concludes with a grand-scale finale that offers a satisfying resolution while still leaving enough openings for a possible second season. Most importantly, even if the characters aren't complex enough to carry the show all on their own, you still find yourself rooting for them all the way through. That's all I ask of an action show: caring about the characters enough to want to see them make it out alright. That's the heart of what makes this show work, actually. Action and cool-factor are nice, but if there's no emotional investment, what's the point? That might not sound like much, but it's something I see people forgetting far too often. It's such a simple story that while writing this review, I initially found myself grasping at straws to find something, anything to say about it that isn't already obvious. But then I realized that being able to sum this show up in not so many words isn't a bad thing. It's a typical story we've seen dozens of times before, doubly so if you grew up reading American comic books, but it feels so sincere and passionate that it's hard not to cheer for it all the way through. It doesn't have to try too hard to be groundbreaking, all that matters is whether it makes the audience want to keep watching. Bring on the aliens, the mad scientists, the mutant plants, the rogue machines and scary weapons, the cool powers and wacky inventions! It's a lot of fun, dammit! That's all I have to say about Heroman at the end of the day, and it's all anyone ever should have to say about it. Isn't that enough? Heroman is a weird one. I'm not talking about the actual content since I always write these opening paragraphs before watching the series or film. No, I'm referring to the fact that it was written by Smiling Stan Lee. Yes, the same one who was President and CEO of the United States' Marvel Comics back before they lost their damn minds and made a lot of insanely stupid decisions like Jubilee becoming a vampire, Nightcrawler becoming half demon, Polaris being retconned as Magneto's daughter, Speedball becoming Penance and if I keep listing these we'll be here for tens of thousands of words. Anyway, Stan Lee wrote the original manga with illustrations by Ohta Tamon. It picked up an anime adaptation not even a year after the manga started getting released from Bones. The same studio behind Soul Eater, Fullmetal Alchemist and Wolf's Rain. So, have Stan Lee's skills at writing goofy and highly entertaining silver age style stories held up and if so how well do they transition to anime format? Face front, True Believers, let's look at Heroman and find out. Young Joseph Jones is a poor teenager living on the west coast. One day he takes a broken toy robot from the garbage and decides to fix it. But fate has its own plans for young Joey. After a lightning bolt strikes the robot it grows to a massive size, transforming into the titular titan Heroman. Joey finds that he can control the behemoth after helping avert a highway disaster. The two face their great challenge when evil aliens called the Skrugg follow a radio signal to Earth with the intent of destroying the planet. Zounds, how will our heroes handle this situation? The story itself is kind of lacking. The skrugg are evil for the evils and don't really have even slightly developed motivations. There's also a lot about the plot that doesn't make much sense not the least of which is bolts of lightning being magic. Heroman gains new abilities as needed by the plot which can come across as overly convenient. The story is also kind of predictable since it does follow a silver age aesthetic. However, the story is fun and a lot of the goofier elements do work in the context of a silly superhero story and those elements that are pretty predictable are vague enough that you can still enjoy watching it. It just doesn't have much tension since it's less a matter of “will they get through the situation” and more a matter of “how will they do it”. Part of what makes the goofier elements work is that it doesn't take itself too seriously and it does have several very funny moments to show for it. The series has characters who largely follow tropes. Including the scientist who does all the scientific stuff instead of having a particular field of study. They aren't bad characters by any means and most of the main cast does get some good character moments. They just don't extend very far from their tropal traits, which kind of works for the series. Heroman himself is a really good example since he's largely defined by... well, being heroic. He can't speak, or chooses not to, and rarely does anything besides fight for justice. It works in context since Joey has to initiate his transformation from a toy to a giant and he's a robot. I also appreciate the fact that regular humans largely don't respond to Heroman with hatred and mistrust, which is a bit of a departure from most of Stan Lee's creations. The artwork is pretty good. Not the best I've seen from Bones but still well done. It features really good action sequences, some interesting alien designs and background Stan Lee because that guy's been appearing in his own work and in things based on his work since... he and Jack Kirby showed up in Uncanny X-men 98, I think. The character designs aren't bad, although Spike Spiegel would consider Psy's hair going too far and Lina almost always wears her cheerleading uniform for no good reason. In all fairness, Psy, Joey, Holly and Professor Denton rarely change clothes either, but she's the worst offender just because her regular outfit is a uniform that's supposed to be worn for practices and actual athletic events. Not as a regular thing. The performances are pretty good. Particularly coming from Komatsu Mikako, Kimura Ryouhei, Obata Mayu & Yasumura Makoto. The music is also well done, overall. It goes well with the aesthetic. There really isn't any. The ho-yay factor is a 1/10. 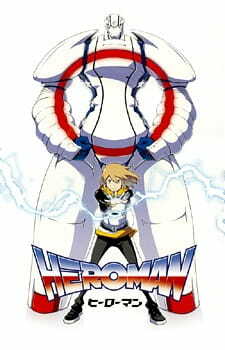 Heroman is a goofy series with under-developed characters and a story that doesn't make a lot of sense in several ways. And I kind of love it. In an age where most super hero comics have gone a darker and stupider route, a series like Heroman that returns to a more fun, exciting, and light-hearted sensibility is very much a welcome change. It blends anime norms with silver age super hero norms and the result is just a very enjoyable experience. It's not deep, but it is unquestioningly and unabashedly fun. Check it out if you're a fan of more light-hearted super hero works or if you just like silly action works. My final rating is going to be an 8/10. Excelsior! Next week, I end the year with a look at Heat Guy J. 1. This is a Stan Lee work. If you don't recognize him he will feel left out during his numerous cameo appearances... and cry. 2. Ratings are a matter of personal preference, so i suggest making judgment by reading the points and not staring at my score. This matters on a number of levels. Don't expect any complicated plot; the first half of the show especially requires minimal internalization of what is going on. This also means when an enemy is destroyed they, hilariously, implode into their exoskeleton, as they are bug men. -Bones animates awesome fight sequences, but leaves out logic. I have to admit that the big showdowns between heroman and his evil foes were enjoyable. Heroman moves slowly as he is a giant tank and gives the impression of a wrestler more than anything else. He even parades in front of your screen and has his own victory sign. Yet, there was always oddities that lacked explanations: How did he repair himself? Why can't missles affect the Skrugg, but his puny fists can? Even in a situation of aliens and toys turning into planetary heros, every story starts of by grounding itself to reality so we can understand it. This is one of the more selective points; you actually have to care about this a lot for this to completely ruin your enjoyment of the show. -The second half attempts to compensate for a weak start. The first segment is cliché as Heroman fights against the army of advanced aliens with their giant spheres, and yes i just said giant spheres. After you infer what happens, the plot thickens, and various encounters with human kind occur. Apparently this proves harder to do as he must keep his secret identity. If you make it through the poor first arc, the second arc will be more worthwhile; unfortunately the third major arc reverts backwards. -Joey is an.. interesting character. One must accept that Joey is not a women. While not bad animation, it lies more in the choice of his hairstyle. Personally, he must be one of the most unintentional ugly characters i have seen, but despite this adversity he makes his sojourn to manhood and becomes the hero he has always wanted to be. If you don't want to go deaf however, watch out for his blood curdling cry for heroman to attack. -Other main characters don't get a lot of development. Denton sensei, and Psy are helpful sidekicks, but don't get any personal attention and are always assisting Joey in his pursuit to save the world. Even Will, Lina's sister, gets no attention at all; If you make it to the end you will realize he is completely forgotten, while the context would be a spoiler i will say that it is odd if you consider how Lina has a brother complex. -Comparing to average anime, it has a good romance. In a world where tsunderes reign, couples can never relax and can never avoid drama, heroman is a breath of fresh air. The local cheerleader expresses interest in our hero from the start and provides a non-frustrating relationship. However, this is not the focus so this never turns for the worst. -Psy gets no character development for a long time. Now, this normally wouldn't bug people so much, and i had a point for development already. However, the fact that we have no explanation to the event that crippled him paranoid me throughout the series. Awesome character made personally awkward. I also always wanted to know where he got that awesome crippled person motorized skateboard too! Stan Lee's 1st cameo in anime.